October 2008 – OpenTech Alliance, Inc. Storage Owner uses Kiosks to Compliment Property Managers! 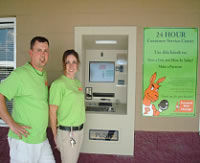 PHOENIX, Arizona – October 9, 2008 – OpenTech Alliance, Inc. today announced that Personal Mini Storage, one of the top operators in the self storage industry, has successfully implemented the INSOMNIAC 900 kiosks at two of their 30+ facilities in Florida. 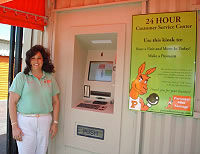 During the last three months the kiosks have collected over $10,000 dollars in total payments, rentals and merchandise at both their Clermont and Broadview facilities. Interestingly, most of the transactions took place during regular office hours; substantiating, that customers are comfortable serving themselves and appreciate the added convenience. Personal Mini Storage owns and operates more than thirty facilities. The facilities include amenities such as automated security gates, video surveillance, self service kiosks, and business services. For more information about Personal Mini Storage, please visit www.personalministorage.com or call (407)297-3683.